I am suffering a rather severe case of Gamer ADD and am struggling to keep my focus on any one project; however, one of this plethora has sort of emerged as something that I may very well have an opportunity to finish sometime in the nearish future. As I have noted, since WotC started to re-release its D&D library as .pdfs, Moldvay’s Basic Edition and B2 The Keep on the Borderland have hogged the 1 and 2 spots of top selling items over at RPGNow. One of my most popular series of posts was an intellectual exercise to see how Moldvay’s Basic Edition would look like if the monster section only had creatures from the Fiend Folio. 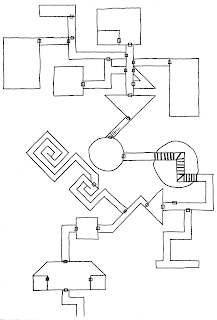 Although I did end up making Wandering Monster Tables and I did stock a dungeon using them, I never took the whole exercise to the next level: producing a version of the Caves of Chaos that would have come with that Fiend Folio’d version of Moldvay’s Basic Edition. Given the popularity of both B2 and Moldvay’s wonderful little red book, I decided to take on the task. I can’t speak for other folks who write adventures, but there are those that fight you every inch of the way (my continuing struggles with my version of The Chateau des Faussesflammes immediately comes to mind) and those that seem to write themselves. When I started thinking about re-imaging the Caves of Chaos infested with Fiends from my favorite Folio, the adventure definitely fell into the latter category. Almost two decades ago, a group of adventurers happened upon a collection of caves on the edge of the Wilderness. They explored them, rid them of all the horrors that dwelt within and returned laden with the riches that adventure sometimes brings. 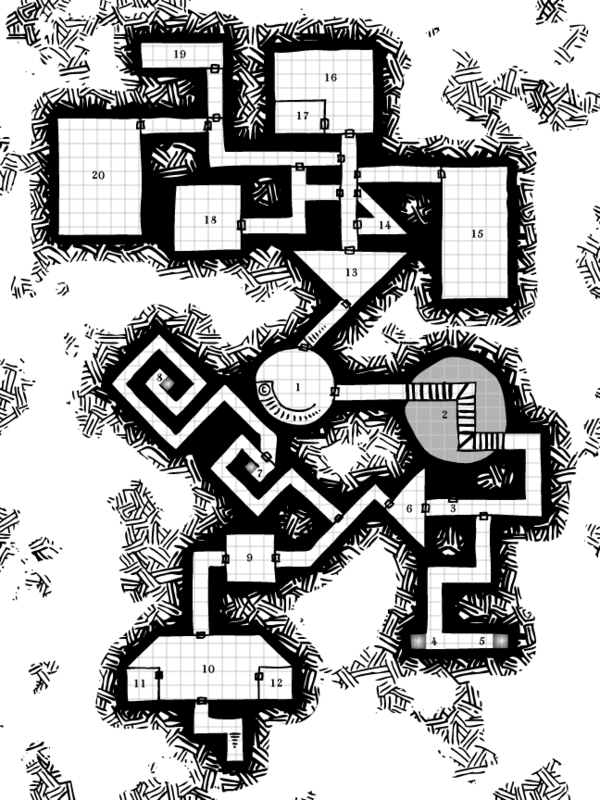 One of their number, Cormakir the Conjurer, decided to make the caves his own with the intention of having them be a new vanguard against the forces of Chaos that lurked in the Wilderness. Unbeknownst to all, there was something yet undiscovered within the caves that corrupted Cormakir to his core. Rather than making the caves a vanguard, he turned them into a laboratory for creating vile creatures intent on wrecking havoc upon Civilization. Fortunately, his experiments got out of hand before he was able to mass an army of Chaos and several of his menagerie escaped. Thus warned, his former companions and a small force of soldiers descended upon the caves and put an end to Cormakir and his depraved research. Though the survivors went thoroughly through the Conjurer’s demesne, they could not find what it was that had corrupted him. Thus, they abandoned the caves for fear of being corrupted themselves. That battle took place ten years ago. There is now growing evidence that there is a new master of the caves, who is sending out raiding parties of humanoids intent on not only wrecking havoc, but taking prisoners. A call has gone out throughout the area for a new generation of adventurers to return to the Caves of Cormakir the Conjurer and rid it of its evil once and for all. Today is the feast of St. Simeon the Elder. From childhood he took up the vocation of a hermit, living in a cave in the Syrian wilderness. Having heard of his holiness, people began to flock to him. Therefore, he withdrew even further into the wilderness by going up into the mountains of the Aman range. Still, people travelled from far and wide to see him. Finally, he withdrew to Mt. Sinai. I am tempted to once again point out the way the hermit’s life is an allegory for the wilderness adventures and end-game of D&D. The pattern of St. Simeon’s life is repeated over and over again throughout the history of Christianity. The hermit goes into the desert (where demons reside according to Scriptural geography) in the same way that mid-level adventurers begin to wander the Chaotic Wilderness. People would brave the desert and the wilderness in order to gain wisdom from these hermits in the same way that adventurers begin to make the Wilderness safe for travelers. The hermit, feeling that they are not yet ready or worthy of such attention, goes deeper into the desert, in the same way adventurers seek greater and greater challenges. This pattern repeats until the hermits are ready, at which time they come out of the wilderness and come back (in the case of Simeon to a place he was famous at before) to build a monastery or serve in some capacity within Civilization. Similarly, the end-game of D&D has the adventurer build a stronghold within the Wilderness that they have made safe for Civilization. This brings me to what I’d rather write about today, especially in light of what happened in the hobby this past week. We live in a society obsessed with what is new. We line up around the block for the latest movie, video game, phone, computer or whatever because it is new. We live under the illusion that progress is not only good, but inevitable. Any serious study of history demonstrates that wisdom and knowledge are always being lost because civilizations rise and fall because we are repeating the same mistakes again and again. In other words, new does not always mean better and we must always ask ourselves what we are progressing towards. The monastery at Mt. Sinai, and others like it, are beacons that illumine the world about the old and ancient that are not only worth preserving, but emulating. Last week, WotC gave all of us who participate in this hobby a very pleasant surprise by releasing part of the old ways of D&D for consumption again. Personally, I was extremely gratified to see that, at least in this small part of the world at large, the folks in this hobby have learned this glorious lesson — we not only want to preserve our past we want to use it. As I mentioned on Tuesday, WotC re-released part of its old D&D library as .pdfs on RPGNow. I don’t know how many of you noticed, but RPGNow’s server crashed on Tuesday due to the sheer amount of traffic that resulted. One might be tempted to chalk this up to the fact that the .pdf library includes both 3e and 4e products. However, I would call your attention to the “Hottest Items” list over on the right side of the RPGNow page. Notice the top two selling items: Moldvay’s Basic Edition and B2: The Keep on the Borderlands. Note also that eight of the top fifteen spots are held by Basic and 1e products, but not a single 3e or 4e product is on the list. It goes to show that WotC has not only done the hobby a great service by allowing us access to our history and that they have been cheating themselves of a solid revenue stream, but that the desire to handle and play with this history is very real. Again, thank you WotC. More please. In my cynical moments, this was a day I thought I would never see. WotC has actually returned the D&D .pdf library to RPGNow! Way to go WotC, you will definitely be seeing some of my gaming budget coming your way in coming days. Thank you! Bonus: the pdfs are of a much higher quality and if you'd bought them in the past from RPGNow, you can download the newer, higher quality versions. Again, Thank you WotC! Today is the feast of St. Macarius the Great of Egypt. 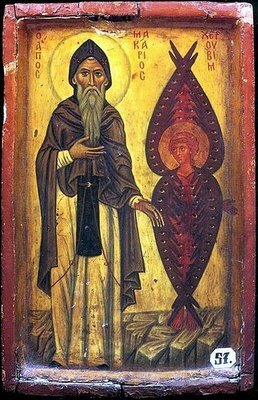 He lived during the 4th century when monasticism flowered and was a disciple St. Anthony the Great — who many Christians hold up to be the father of monasticism. There are extant fifty homilies attributed to him. As with many of the desert fathers, St. Macarius focuses on the internal struggles that are central in a Christian lifestyle. As such, he lays bare one of the primary challenges that Christianity poses to RPGs, especially the kill the monster and take the loot kind of games such as D&D. Historically, the ideal Christian hero is the contemplative who spends most of their life in prayer, dealing with the internal struggles that St. Macarius writes about. This does not lend itself well to the kind of adventures that one expects when playing an RPG. If we take St. Macarius’ description of the internal struggle of the Christian and make it external using the very words that he uses we end up with the megadungeon. The Greek word for “deep” in Sirach 42:18 is actually “abyss” and has the connotation of being bottomless (signifying that there are always going to be new levels of the megadungeon to explore). Sin has infected the deepest chambers of the earth — where monsters are sin personified. The megadungeon, as suggested by the image of a tree whose branches reach down into the soul, is itself a living thing that grows, changes and actively works against those who are trying to cleanse the dungeon of sin (monsters). The deeper one goes, the harder the megadungeon tries to repel invaders (the monsters get bigger HD the deeper the dungeon level). This is very suggestive of what I mused about when exploring a Homlesian vision of the Dungeon and of Philotomy’s Mythic Underground (which sadly appears to be offline). 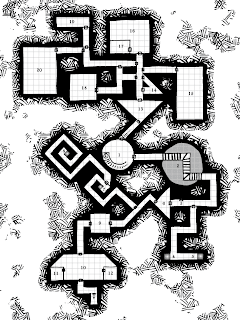 It also strongly supports the idea that the megadungeon is always going to be an underground wilderness that is always filled with monsters — in a fallen world, sin will always be pervasive (this, BTW runs counter to the way I have run my games where PCs are capable of recovering sections of dungeons). Treasure, therefore, becomes the mechanism by which a character’s progression toward their potential is measured. The gold, jewels and magic found within the megadungeon is akin to finding the inborn beauty that is the human soul. In other words, the recovery that I normally allow to play out as PCs cleansing a section of dungeon and making it safe, occurs not in the dungeon but the characters themselves. This treasure, in turn, is used to buy better equipment (to better the chances against greater and greater sin) and ultimately to build a stronghold where others come to improve themselves under the tutelage of one who has fulfilled their potential. Again, the recovery of the world from sin is measured in persons rather than geography. As someone who grew up assuming the naturalism of Gygax and Arneson (and who, frankly, still uses it on a regular basis), I find this vision of the dungeon fascinating. The campaigns that would naturally arise from these non-naturalistic assumptions would be far more abstract or specifically game-oriented. Cities exist, not due to political reasons, but because of their proximity to dungeon entrances. In a world where G+ is emerging as a primary way for a lot of people to play, one could imagine a city of portals that lead to a variety of “dungeon worlds” where the rules of the universe change slightly (as reflected by the whims and quirks of different DMs/GMs/Labyrinth Lords/Referees). Expeditions are organized by inhabitants of the City of Portals (aka FLAILSNAILS?) into one or more of these dungeon worlds as game sessions arise and are played, all the while trying to fulfill their own potential by seeking out the externalized depths of the soul and rooting out the externalized sin that infects it. Recently, I had the opportunity to purchase either the WotC re-release of the AD&D DMG or a hardcover edition of Matt Finch’s Tome of Adventure Design (I didn’t have the budget to do both). After thinking about it, I realized that the only reason that I wanted the DMG was to support WotC for actually bothering to re-release some of their older stuff and that I’ll have other opportunities this coming year to do so. In contrast, I wanted the Tome because I actually wanted to use it. And use it I have. I have to admit that I let my work on The Chateau des Faussesflammes go fallow because I was stuck. Despite the fact that I had some really great ideas including dungeon features, NPCs, villains and even a couple of decent maps there wasn’t that one thing that strung everything together and answer that elusive question Why? A notebook, a pair of dice and a about a half an hour with the Tome helped me answer that question — which is why I have been furiously making maps this week. The adventure itself is called The Ethereal Maze of the Feathered Priesthood. It refers to a training facility used by an avian race (possibly alien) to weed out unworthy acolytes from the aforementioned Feathered Priesthood. About a decade ago, the Villain got a hold of a map which was supposed to lead him to an artifact called the Head of Disunity. Interested in breaking apart the Kingdom so as to take advantage of the chaos to take over he set out on a quest to retrieve the evil artifact. In process, he made a mistake and misread the map. As a result, he ended up at the Ethereal Maze. Therein is a glowing tree which produces a black, effervescent syrup-like liquid used by the acolytes in their exploration of the maze. When the Villain did not find the Head of Disunity, he threatened the occupants and in the end tried to cut down their tree. Unfortunately for all involved, this resulted in the liquid gushing forth and infecting entire areas of the Maze. In large enough quantities, it causes insanity. The Villain, himself infected, ran away dropping his map as he fled. The inhabitants of the Maze all went insane and the facility has been abandoned. The tree continues to seep its black liquid in large quantities. Thus, the Maze offers up the possibility of all kinds of crazy monsters mutated by long exposure to the liquid, including the original occupants as well as the hazard of the liquid itself. The hook involves the Villain, who has been recovering his sanity for the past decade and is finally active again. A Patron of the PCs has found out that he is after a map that lies somewhere within the Maze and has sent agents to go find it. The PCs are tasked with getting the map before it falls into the Villain’s hands. All this was made possible because of a bunch of random tables and the creativity of a little girl with some help from her dad. 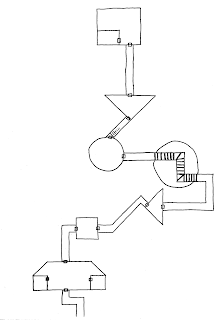 This is a great adventure location with a built in race against time, an excuse for coming up with surprising monsters, a cool magical liquid that could have far-flung consequences and uses, an evil artifact that exists somewhere in the world (another higher-level adventure), a villain who wants to go get it and an implied political setting to boot. In other words, Matt Finch’s Tome of Adventure Design has already paid for itself, as far as I am concerned. If you haven’t bothered to take a look or make use of it, I can’t recommend it enough (something, unfortunately, I've never been able to say about the DMG). I have to admit that I was struggling this week with what to write about for this post. I always look ahead at the saints celebrated on the coming Saturday and normally one just jumps out and inspires with all kinds of ideas. Not so much this week. And then the Theotokos (the Virgin Mary) decided for me. 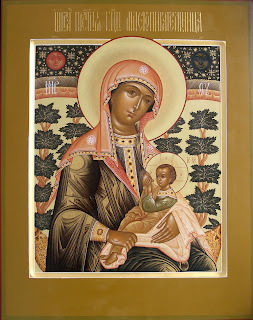 Last night arrived an icon my wife ordered from Romania and today is its feast day. Thus, My Lady the Theotokos the Milk-giver has requested that I write about her. This is a rare icon showing the Virgin Mary breastfeeding the Christ child. It is a pictorial theological statement that started in the sixth century A.D. in reaction to the various heresies that are scandalized in part or in whole with the Incarnation. There have been various attempts to explain away (and therefore deny) the idea that God Himself in the second person of the Trinity would humble Himself by becoming a helpless babe dependent upon His mother for milk. This icon definitively defends this understanding of Christ. How do you nurse the Master? In the thirteenth century, St. Sava of Serbia (also celebrated today) visited the monastery of his namesake (the Lavra of St. Sava the Sanctified) near Jerusalem. When Sava of Serbia approached the relics, the staff of Sava the Sanctified fell to the floor at the feet of Sava of Serbia. This was a fulfillment of a prophecy given by St. Sava the Sanctified some 700 years earlier. He said that a royal pilgrim bearing his name would visit and that the miracle-working icon of the Theotokos the Milk-Giver should be given to him. The father St. Sava of Serbia was the Serbian king and his mother was the daughter of the Byzantine Emperor. 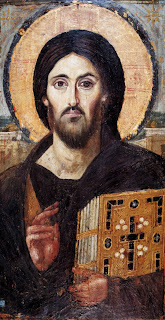 Today the icon is in the Serbian monastery Hilandar on Mt. Athos. In a sandbox type of campaign, one of the most useful tools of a DM/GM/Referee etc. is the Patron. They are an excellent source of rumors, adventure seeds and sponsors for expeditions that players might not otherwise be able to afford or have the means to undertake. This feast in honor of the Icon of the Theotokos the Milk-giver demonstrates that, with a little thinking outside the box, that a Patron need not necessarily be a regular NPC. Saints can be Patrons, as can relics, artifacts and magic items. For example, imagine a party coming into town needing the healing services of the clerics of a particular church or monastery (or training or any number of things a party would routinely show up at such a place). There could be a visiting dignitary trying to move an icon or some relics to another place or their could be some kind of artifact that resides there. When the PCs arrive with their request, a staff falls at their feet, the artifact reacts in a particular way or the relics themselves have been refusing to be moved until the PCs show up. In this way, these objects are communicating that they wish the PCs to undertake some task — such as moving them from Point A to Point B. These tasks can always be refused, of course, but then the DM/GM/Referee etc. has an excuse to have this object NPC mess with their lives in small ways until such time that the task is complete. On the surface, this may seem to be a tool in the rail-road-type campaign toolbox, and it certainly could be used in such a manner; however, if one roleplays the situation and its aftermath instead of imposing mechanical consequences this can add a whole new layer of depth to a campaign world where PCs can have relationships with unconventional things like magic items, relics and artifacts. While there are certainly more choices than her first attempt (and even a false door! 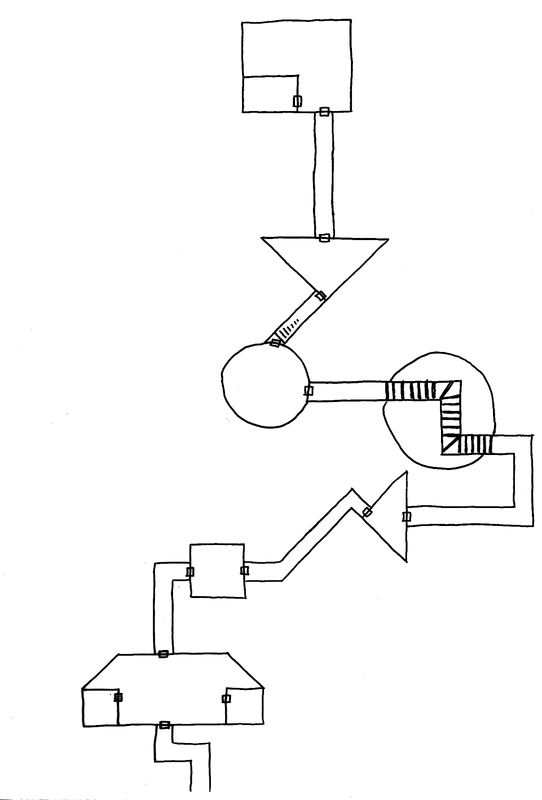 ), this is still a rather linear dungeon level. Once entered, there is really only one direction to go and most of the choices made by adventurers are false ones — they lead to a bunch of dead ends and they are therefore still forced in one direction. It was at this point that my daughter made her cute face and asked if I could pretty please use her map and make it all pretty in the computer — something that I could not say no to; however, I insisted that we make a few minor changes into order to make the dungeon level less linear and the choices made by adventurers meaningful. The former entrance is now a stair leading to a lower level. The new entrance is a stair leading to a room with two doors that lead to two distinct sections of the level. Each of the dead ends now have teleporter squares which will take adventurers to other levels. The hole over which the crooked bridge crosses is now a huge pit which connects to other levels. 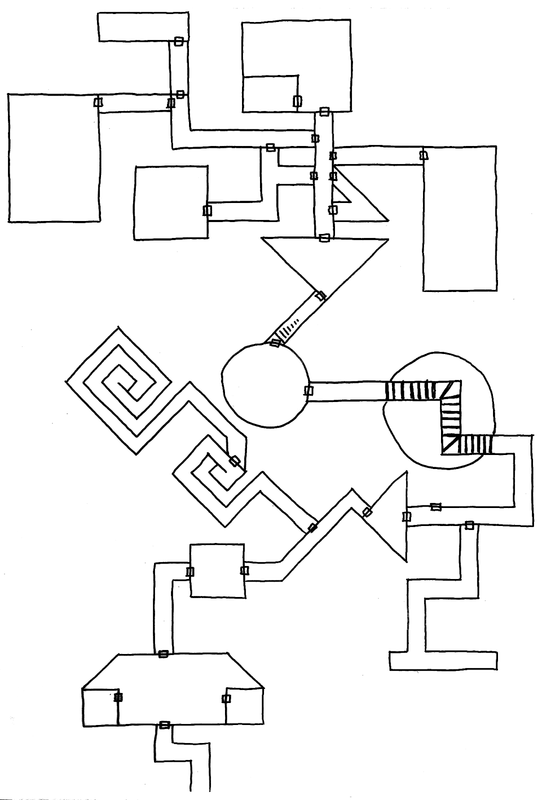 The result is a small dungeon level that I would be excited to add to one of my dungeons — it has the potential to offer all kinds of adventuring goodness because it allows player choice and each choice has real meaning. 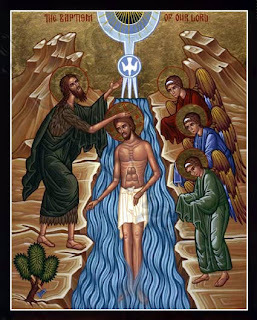 One of the reasons I haven’t been posting much at all in the last week is that Theophany (aka Epiphany — when Christ is baptized by John in the River Jordan) is today — on a Sunday. In the Orthodox tradition, this means a major shake-up in the order of services. While Christmas nicely emphasizes the Incarnation, it does not explicitly include the other two persons of the Trinity. Not only do I wan to wish the blessings of the sanctified water upon all who bother to read my blog, but I also wanted to highlight the idea of time in terms of an RPG. One of the things that makes a really good adventure is placing pressure on the party through time. Most often this takes place in terms of resource management — how long will our torches last? how long can our cleric keep us healthy enough to survive another encounter? One can also use time as a limit before something bad happens, like (to use the Rescue the Princess trope) the dragon eating the princess at dawn. 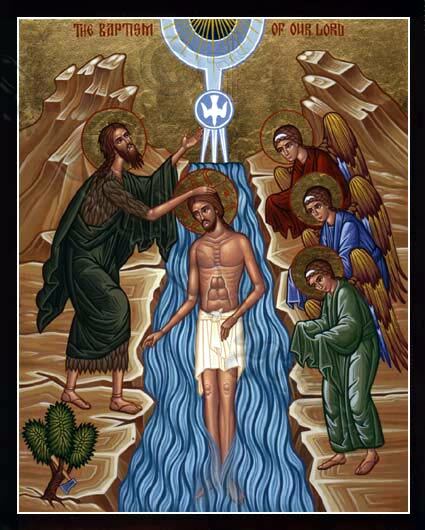 Today’s celebration of Theophany also calls attention to yet another use of time. This week has been nothing but preparation for me because of having to prepare for all the changes that happen because Theophany falls on a Sunday. In other words, time can dictate major changes in a dungeon or an adventure location depending upon when one goes there. For example, there might be a door that can only be seen and opened during a full moon (as in the Lord of the Rings) or an entire section of dungeon (which might hold the key to an important treasure hold) is only present at certain times of the day, week, month or year. The extra danger for the adventurer is what happens if they stay too long? Where do they end up? Trapped until the next time this dungeon section is due to appear? Or do they end up in another dungeon that this section is apart of the rest of the time? Or do they end up on an entirely different world? Today is the feast of the Prophet Micah, but not the Micah that you might expect. Micah the minor prophet, author of the Prophecy of Micah is celebrated August 14th and lived some 150 years after the Micah celebrated today. Rather, this Micah is the son of Imlah mentioned in 1 Kings 22 (3 Kings by LXX reckoning). He lived at the time of Elijah and prophesied the defeat of Ahab at the hands of the Assyrians for which he was cast into prison. I have suggested in a previous Saintly Saturday that prophets make very good clerics and Roger of Roles, Rules & Rolls has run with the idea. The story of Micah son of Imlah puts an interesting twist on the whole affair. In my own games, where I emulate a medieval Christian Church, how to handle evil clerics becomes a bit of an issue. If clerics receive their spells by divine energies and there is only one God, how can pagan or evil clerics get any spells? My answer has always been to run them as magic-users dressed up as priests. In other words, one possible interpretation of how clerics get their spells is through spirits. Some of those spirits can be lying spirits. This opens the door to evil clerics who channel those lying spirits. The fact that the lying spirit went into Ahab’s prophets doesn’t take away from the fact that Ahab still chose to go against the Assyrians at Ramoth Gilead. Being made in the image and likeness means he had free will to listen to Micah and avoid his own demise instead of only listening to what he wanted to hear. Therefore, God doesn’t create tragedy — it is something we either bring upon ourselves through our choices or as a consequence of living in a fallen world (which came about because of a choice to turn away from God). God can and does take any tragedy and turn it into some kind of good. This is best exemplified by the Cross — the worst tragedy in the history of the world (everything pales in comparison to the God of all crucified by His own creation). He turned that into resurrection. They are doing so of their own free will. God can work good even through their evil (quite possibly as a result of the PCs reacting to the actions of the evil clerics). For myself, this is something I would not use in my normal setting (seeing Christian spell casters as clerics and pagan spell casters as magic-users works really well in that context); however, if I were ever to pursue a campaign world that emulated an era of prophets prior to the Incarnation, I would be sore tempted to use it.